With his writings on phenomenology, psychoanalysis, Marxism, ideology, and religion, Paul Ricoeur has single-handedly redefined and revitalized the hermeneutic tradition. 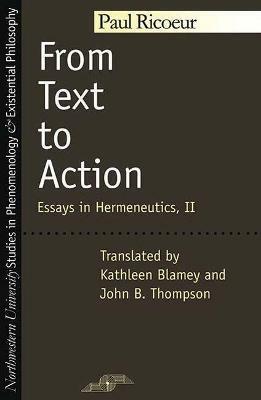 From Text to Action is an essential companion to the now classic The Conflict of Interpretations. Here, Ricoeur continues and extends his project of constructing a general theory of interpretation, positioning his work in relation to its own philosophical background: Hegel, Husserl, Gadamer, and Weber. He also responds to contemporary figures like K.O. Apel and J rgen Habermas, connecting his own theorization of ideology to their version of ideology critique.